A-fib is the rapid contraction of the upper two chambers of the hear (the right and left atrium). This rapid contraction is not coordinated so it is ineffective in pumping blood. Thus patients with A-fib have an irregular heart beat and their heart output (the amount of blood that it pumps with each contraction) is decreased. Sometimes the heart rate becomes very fast and the blood output becomes very low (the pump becomes very ineffective when it is pumping real fast). A-fib with a rapid heart rate is a life-threatening situation. The rate must be controlled-but if high calcium is the cause, then it can be hard to control the heart rate until the high calcium is fixed (the parathyroid tumor is removed). We see A-fib in our parathyroid patients almost every day, yet we remain amazed that most of our patient's referring doctors are not aware that the A-fib is probably caused by the high calcium The incidence of atrial fibrillation increases with age, occurring in about 8% of individuals over the age of 80 (see footnotes). In our patients with high blood calcium due to hyperparathyroidism, 41% of patients over 80 have A-fib (69% of males and 21% of females). Thus the rate of A-fib is up to 9 times higher in patients with hyperparathyroidism. In a non-scientific review of our most recent 20,000 patients operated on for primary hyperparathyroidism at the Norman Parathyroid Center, 6% currently have or have been treated for A-fib (that's 6% of ALL people with hyperparathyroidism where the average age is 59). 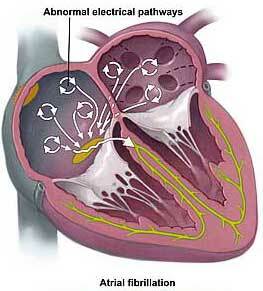 Today's parathyroid blog is prompted by two cases of A-fib we saw today. The first case of A-fib occurred in a 68 year old gentleman with primary hyperparathyroidism. His records show that he had elevated calcium (above 10.2 mg/dl) since 2003 (10 years). This has been "monitored" by his doctors every 5-6 months, and thus we have documented 21 high blood calcium levels (YES! 21 high blood calcium levels!). Since the calcium has not gotten "too high", his doctors continued to "watch" it (this is poor medical care and shows a tremendous lack of knowledge about hyperparathyroidism). Three months ago this gentleman had a fainting episode and was found to have atrial fibrillation. He began seeing an excellent cardiologist in West Palm Beach who quickly recognized that this A-fib was likely due to the high calcium and he referred the patient to our center for parathyroid surgery. The second case today shows a very similar pattern as the first. A 72 year old gentleman from Syracuse, NY had high blood calcium for 11 years (again, we have 18 high blood calcium levels documented and 4 high PTH levels, but since the patient's sestamibi scan was negative, the surgeons in Syracuse declined to operate). He developed A-fib 2 years ago and has since underwent 4 attempts at cardioversion (a medical procedure aimed at shocking the heart back into a normal rhythm). None of these four attempts were successful and then the patient underwent a dangerous and expensive cardiac ablation procedure where part of the heart is "burned" to prevent the abnormal conduct of electricity within the heart muscle. This did not work (big surprise!) and the patient was then sent to a more expert cardiologist who immediately recognized the problem and put this man on a plane for Tampa to get his parathyroid tumor removed. A-fib can be caused by high blood calcium. A-fib is present in just over 50% of people over the age of 75 if they have hyperparathyroidism for 10 years or more (unpublished data from our database of 20,000 patients). Clearly "monitoring" high blood calcium is not a good idea-it will slowly kill the patient. Attempts at cardioversion are almost always unsuccessful, or not long-lasting when successful-as long as the blood calcium remains high (any level over 10.2 mg/dl will typically prevent successful cardioversion). Anecdotal evidence from our practice is that A-fib due to high blood calcium and hyperparathyroidism is MUCH more likely to resolve if the parathyroid tumor is removed within 3 months of A-fib onset. We have seen only a few cases of A-fib resolution (via successful cardioversion or spontaneously) when parathyroid surgery has been delayed for more than 1 year after A-fib onset. Remember, the complications of high blood calcium and hyperparathyroidism are due to the duration of calcium levels above 10.1 mg/dl. How high the blood calcium has become is not a good indicator of the severity of hyperparathyroidism. The problems are due to how long the calcium has been high, not how high it goes. Waiting for a "magic" higher calcium level to occur before sending a patient for parathyroid surgery is not based on the facts of this disease. A calcium of 10.5 mg/dl for a number of years is just as deadly as a calcium level of 11.5. Get the parathyroid tumor removed prior to the development of these problems! For more information see the parathyroid.com page on age differences in patients with hyperparathyroidism. See the main "Symptom" page of parathyroid.com where A fib is a common symptom. Relation of Serum Parathyroid Hormone Level to Severity of Heart Failure. Published in 2012 in the American Journal of Cardiology shows that high PTH levels are associated with more severe heart failure and death. More about A-Fib from St. Vincent Health.